The prisoner smiled and said, 'Father after I die you will pray for my soul to rest in peace. All I want to convey to you and others of your ilk is that I am just fighting for freedom and release from a life of slavery. I have been branded a terrorist. But one man's terrorist is another man's freedom fighter. In my eyes, I am just a freedom fighter. Till the day comes when people like you learn that, my soul will not rest in peace.' The priest shrugged his shoulders and moved away. The prisoner looked at the hangman who had moved forward with the hood and said, 'I don't need it. I prefer to die with my eyes open.' The hangman let it be and finished his job. 'Dad! I want to visit the King's banquet hall!' 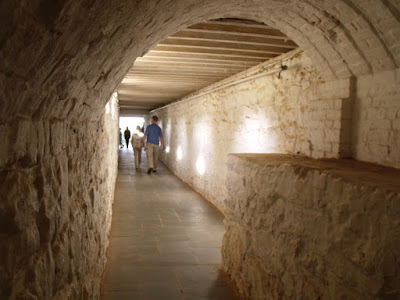 My eight-year-old son exclaimed as we walked through the pathway leading away from hangman's nook in the ancient fort which we had just visited. With a start, I realized I had been day-dreaming. Yes, the prisoner was right; one man's terrorist was another man's freedom fighter indeed. That's a deep thought, Jai. If only these terrorist-freedom fighters had some value for the lives they put at stake for the sake of their freedom.